In the year 1656 Anno Mundi (years from creation), the Lord destroyed the entire earth with a cataclysmic flood. He did so by removing the layer of crystalized ice that surrounded the earth. This ice barrier protected the earth from receiving the full power of the sun. God lowered this ice barrier into our atmosphere and in the process, caused the ice undergo sublimation (ice to vapor), quickly forming massive storm systems. These storm systems allowed torrential rains to hit the inhabitants of the earth with all the power and fury of a hurricane for forty-straight days. If that were not bad enough, God also caused the earth’s crust (lithosphere) to break apart. The waters under the crust of the earth burst forth from the ground, creating the fractures that formed the tectonic plates we see today. The subterranean waters added to the deluge that quickly engulfed the largely flat terrain of those days. The mountains and mountain ranges we see today came because of this breaking apart of the earth’s surface; they did not exist before the flood event. There was nowhere to run. There were no hills or mountains to climb, nor man-made structures tall enough to escape the rising waters. Even if their where, the earthquakes from the tectonic plates breaking apart would have levelled them anyway. A watery judgment was coming, and none would escape a watery grave. The world’s population grew quickly, becoming exceedingly wicked, violent, and evil over a period of 1,600 years. Mankind had intermingled with the fallen angels and produced some hybrid form of beings that managed to somehow pollute the entire human gene pool, save Noah and his immediate family (Gen. 6:1-9). Most of the antediluvian peoples from Adam to Noah, ignored God’s appointed messengers (Enoch, Methuselah, and Noah) for hundreds of years and would not repent. It had never rained before the flood (Gen. 2:5-6), so the idea of a judgment by water seemed ridiculous, until it happened. All we know of the antediluvian world, is what Scripture tells us. We might gleam some more insights from some non-canonical ancients manuscripts, but we get the gist of what life was like in Genesis 6. The world was wicked, violent, and only bent on evil. If that is the case, then the world of 2018 is not much different. As of 2018, the world has hit a population of just over 7.5 billion people. The world today is presumed to be relatively “peaceful,” yet there are 10 active wars and eight armed conflicts going on at present. Moreover, the past 118 years has proven to be the most violent the world has ever been. 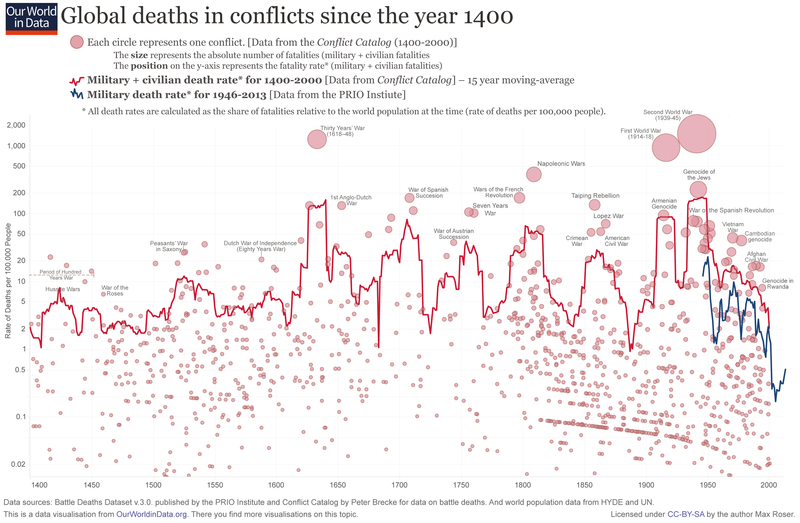 We underwent two world wars, and hundreds of smaller conflicts killing hundreds of millions. In fact, more people died in the 20th-century alone due to war and its aftermath, then had we in all the previous centuries combined. The reason being is that a) our population is significantly larger, and b) our weapons are significantly deadlier. We could kill quicker and easier in these past two centuries, then at any time in our past thanks to guns, bombs, chemical/biological/nuclear warfare, and many by many other means. The world of 2018 is consumed with hedonism, especially in western nations. The pursuit of pleasure in all its forms, has reached such a state, that even the poor in America have a better quality of life than even royalty had in centuries past. Ice was considered a luxury, and now we can get it anywhere. Air conditioning and automobiles make living anywhere, more accessible and comfortable. We no longer have to grow our own food, but buy it at stores. We are bombarded with more information from birth to 10 years of age, then people had acquired over a life time in centuries past. The Internet has not only provided more information to the general public at any time of the day, but has connected the world into one giant community via the World Wide Web. While these are not unique to the western world, they are most visibly obvious in the West. The reason for this is because they are direct byproducts of a culture bent on hedonism and materialism. They hearken back to an ancient time when mankind had a lot of free time on their hands, and only thought of things that would bring them pleasure and wealth. Unfortunately, hedonism and materialism ignores the core drive of our spiritual nature (1 Thess. 5:23), and causes one to seek solace in things that cannot bring peace. Objective truth must be replaced with subjective reasoning in order to ignore the warning signs that began to show up in their lives like red flags. They move away from biblical Christianity because it is the only belief system that shows what a wretched state we are really in. In their desperation and fruitless search for God in things that are not of God, people see no value in themselves or in life. They become angry and bitter. They lose hope and ultimately succumb to their inner demons by mistakenly seeking death as a means to end their suffering. In the other parts of the world, the masses are suppressed through violent ideologies and religions, whether it is communism, socialism, or Islam. Many others are suppressed through false polytheistic religions that teach that their life exists only as an endless cycle of birth and death. Still others are suppressed by belief systems that teach we have to earn our own salvation by becoming enlightened by our own efforts. We tend to think that because one religion is not as violent as the other, that they are somehow better or more tolerable. This ignores the basic truth that regardless of whether an ideology is violent or not, there are still terrible, dark, demonic forces that govern these belief systems from behind the veil of our physical domain. While we cannot know specifically when Christ will return, we only know that He absolutely will (Num. 23:19, John 14:1-3). Jesus told us to look for signs that would mark the season of His return, which one of, was a return to the days of Noah and Lot. Both men lived in very wicked times and places, and their deliverance was not only notable, but necessary for divine judgment to be brought forth. It does not bring God pleasure to unleash His wrath upon the inhabitants of the earth, and He is longsuffering that any who would repent, could. However, his longsuffering is not limitless. There will be a point in time, when the fullness of the gentiles comes to pass, and a fullness of time when Christ brings this current dispensation to a close (Rom. 11:25, Eph. 1:10). The world is currently undergoing the birth pangs of signs, as described by Jesus in His Olivet Discourse (Matt. 24, Mark 13, and Luke 21). Christ promised us that we would have trials and tribulations in our life, and that we would be hated by the world because we are with Christ (John 15:18, 17:14). But these are necessary and logical when we consider the natural order of this particular dispensation. If the church (the universal, multi-membered body of Christ) was conceived by the Holy Spirit at Pentecost (Acts 2), then the more intense the birth-pangs, the closer we are to our birth (and deliverance). These birth pangs will ultimately reach its fullness and give birth to a redeemed, incorruptible, glorified Church (the bride of Christ) who is caught up into heaven with Christ (1 Thess. 4:13-18, 1 Cor. 15:51-56, John 14:1-3, Rev. 3:10, etc.). And then the world will undergo an unknown period of time (a gap) marked with chaos, rampant apostasy and wickedness unlike the world has ever seen. It will be even worse than the days of Noah, because not only will man be unrepentant, but he will have the advanced tools of his modernization to aid him in his wickedness. Not only this, but the supernatural veil between the physical and spiritual domains will be lifted, and an age of signs and wonders will occur again (2 Thess. 2:9, Rev. 11:1-14). Dark, spiritual forces and principalities will flood the earth unlike ever before. At a certain point, the nations will focus their attention on the tiny nation of Israel and enter into, or confirm some form of covenant. This marks the final seven-years of man’s rule on the earth. They will be led by two, the Beast and the False Prophet. They will have the technology to control all buying and selling on the earth, and they will make people either worship the Beast and take his mark (666), or they will take their heads. This man of sin will rule the world for only three and a half years, and will ultimately attempt to finish what Adolph Hitler and others have tried to do, to exterminate the Jews. He will desecrate their temple at the midpoint of the 70th Week, setting himself up (or his image) as God in the newly rebuilt Jewish temple as to be worshipped (Matt. 24:15, 2 Thess. 2:4, Rev. 13:6). But in order for all this to materialize, certain events must happen. In order for him to desecrate the temple, there must first be a Jewish temple. In order for there to be a Jewish temple, there must be Jewish control of the Temple Mount. In order for there to be Jewish control of the Temple Mount, the Muslim Waqf’s must relinquish control of it. In order for the Muslims to relinquish control of the Temple Mount, the Muslims must be dealt a stinging, supernatural military defeat. ü In order for there to be a stunning, supernatural defeat, the Muslims must already be aligned and positioned militarily against Israel. ü In order for the Muslim nations and organizations to be arrayed against Israel, the world powers (US, UN, EU, RUS, etc.) must have allowed them to amass weapons and hostile peoples to build at her borders. ü In order for the Muslim nations to gather against Israel, there must first be a nation of Israel to gather against. As you can see, we are in the end game now. All that remains is the supernatural, stunning military defeat of the armies gathered against Israel in the battle of Gog and Magog (Ezekiel 38-39) to kick of the events inside the 70th Week of Daniel. Turkey, Russia, Iran, and many other groups are already arrayed against Israel in what used to be Syria and Lebanon. Although we do not know when this battle will occur, we can see the geopolitical storm clouds already gathering overhead. The political, economic, and demographic challenges that Russia, Turkey, and Iran are currently facing, means that they will be forced to “take a spoil” sooner, rather than later. What is currently preventing them from acting? Aside from the fullness of times, and the Restrainer, what remains is a strong United States led by a decidedly pro-Israel administration. Israel’s enemies will not attack as long as the US has her back. However, there is an unintended consequence as a result. This creates (or is in the process of creating) a false sense of peace and security for Israel, who will dwell safely in their land of unwalled villages. If the US is prospering militarily, economically, and politically, then there has to be something that sidelines us and allows this attack to happen. If all we can do is offer a diplomatic protest, then that means the US is not in the position to do anything about it. While there remains a lot of potentialities, the one I believe will actually happen, is the Rapture of the Church. It has all the characteristics of perfect, global crisis. It will destabilize the materialistic west to the point that they rush head first into the waiting arms of this final, beast system. Many shall also be taken from the east, north, and south as well, and they will make up the full body of Christ. And then comes the end. Keep looking up, we are very close indeed!